There is some very interesting reading in this thread. I never thought much about it, but it sounds as if knife making was a bigger part of the economy than I would have expected. In some places, anyway. Thanks for posting, fellows! Dinadan: Well, as for knifemaking and the magnitude that would be its sector in a pie chart of the American economy, I do not have. But, I do recall reading that prior to WW I 90% of Americans grew up on farms. Some of those folks may have milked the cows, collected eggs or pitched manure before going into town to work in a store or shop; but still, they were daily exposed to strenuous manual labor. And, this would mean a handy knife would have been a necessity for nearly every worker. Even in the kitchen, the ladies of the house would not have been buying dressed chickens, in parts, all on a styrofoam tray and wrapped in cellophane from a market, but would have needed a good cleaver to do the requisite processing at home. I have collected a lot of vintage American-made light weight “kitchen cleavers”, which utensils are no longer a regular consumer item. LongBlade: When you speak of Sheffield knife-making having slid downhill after 1891, you are referring to the volume produced and exported, I assume. I will add that the quality purportedly also declined, if gradually, after World War I. This is usually attributed to the claim that many skilled employees never returned from the war. Additionally, the Great War was a fundamental turning point for all societies of the Western World; that is, not much was ever going to be the same. The Old Order had abruptly been swept away, and knife making was going to reflect the changes. I once engaged the late Jim Taylor in a discussion several years ago that touched upon this topic. There are many collectors that will remember Jim, who was a British émigré dealer. He could be readily spotted at the shows because he was the guy wearing a bowler. 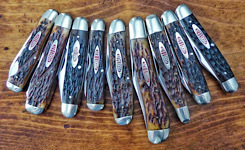 Jim averred that to assign a date to many Sheffield knives, especially if produced by one of the large and long-lived firms whose "town patterns", etches and tang stamps varied little over several decades, you could only go by quality. No date stamps or “dot” codes were going to give their age away. As Jim put it to me, other than indicating that a Sheffield knife was issued post-1891, due to “England” being stamped on the tang, you had to “handle these things all the time…you get a feel for these things after a while”. The assumption was that over time the quality decreased. Then he went on to say that he had put in 40-50 years looking at knives, and his wife Cindy had been a pro for 35 years. And, what wonderful catalogues Jim and Cindy published for several years, of some of the nicest American, German and English folding and fixed blade knives! Then came the internet. It is also important to point out (and I know many know the following) but CT (and MA and of course NY along with PA) were centers of the cutlery industry in the 1800s and early 1900s that were indeed almost completely wiped out by the depression of the 1930s (many of which went under way before the depression) though literally a few survived into the mid 1900s and very few exist today but not in CT… I can say in CT where there were practically 90 knife factories or cutlery shops during the “heyday” of the 19th and early 20th centuries that all but a few ceased to exist by 1930... There were but a handful left that eventually went under in the mid 1900s and today essentially none exist barring a few custom makers….. Very sad but times changed..
Alas, the vintage knife elegance, reflective of Victorian and Edwardian aesthetics -- the shields, for instance, evocative of heraldry -- is now passé for modern-day knife makers and users. Now the practical and tactical predominates. Only the outlying few still hew to “pleasing-to-the -eye” (form) and function in their carry knives. Some of the “slide” may have to do with the fact that in the 19th Century our brainiest people were doing advanced work with metal and machines, and set a standard that carried to some extent into the mid-20th Century. For decades now that cohort of intellect has had its attention on electronics and beyond. And, in general, the quality and appearance of our physical objects has suffered accordingly. Here is another addition to this thread on “Real American Knife Lore” but as opposed to an interview this was an article in the American Cutler Journal of June 1921 entitled “Remington Enters Cutlery Field”… It describes their cutlery business in detail as to why it was started in 1919 and is an excellent wide angle view of the whole Remington knife making production process from start to finish including marketing. (NOTE: This was a pdf which can’t be posted on AAPK so after much trial and error I turned it into jpegs of each page - unfortunately the photos wouldn't copy with the article text so any figure photos from each individual page would be below though the legend should be mostly on the original page (sorry if this sounds confusing but you will see as you read and go from attachment to attachment. This will have to be 2 continuous posts to get all the pages and photos included due to attachment restrictions per post. Just a note - the last attachment which is the end of article ends about halfway or so down the page. Importantly you may need to increase your screen view to over 100% or find your reading glasses ) …. Personally I can now see why Remington put out so many knives - lots of workers and equipment - and a step by step sequential process from raw materials to a finished product that was so well organized ... Hope most enjoy it – indeed it really gives insight as to knife factory processes! Thanks for posting this lee. Super helpful for me with my little project. I’m having trouble finding the September 1927 addition of the journal can you or someone her help?? JAMESC41001 wrote: Thanks for posting this lee. Super helpful for me with my little project. I’m having trouble finding the September 1927 addition of the journal can you or someone her help?? Glad it was helpful Jay .. Sorry but don't have any issues from 1927... I wish I had found others but nothing later than 1922 at least on the internet - The few annual compilations I found on the internet are huge pdfs... anyway I wonder as the industry started to decline during the 20s if the journal also went under - I am just thinking and really don't know... It was a monthly journal and quite enjoy looking at them (The American Cutler Journal), a few interesting articles and the advertising is very cool ..